Cyrene (Greek Κυρήνη, Kurene) was an ancient Greek colony in present-day Libya, the oldest and most important of the five Greek cities in the region. It gave eastern Libya the classical name 'Cyrenaica' that it has retained to modern times. It lies in a lush valley in the Jebel Akhdar uplands. Named after a spring, Kyre, which the Greeks consecrated to Apollo, the city was the seat of a famous school of philosophy in the third century B.C.E., founded by Aristippus, a disciple of Socrates. Cyrene became one of the great intellectual centers of the classical world. An important city under first the Greeks and then the Romans, it was a target of the Arab conquest of 642-3. It was at this point that this once glorious city was abandoned and eventually forgotten. The history of Cyrene is the same history that befell much of the ancient world: one empire conquering another. Considered one of the most important Classic Greek sites outside of Greece, second perhaps only to Leptis Magna, in 1982 the ruins of Cyrene were designated a World Heritage Site by UNESCO, who deemed it "one of the most impressive ruin complexes in the entire world," and credit modern knowledge of Hellenic sculpture to the Cyrenic ruins. Yet today, it is one of the most neglected and endangered World Heritage Sites in the Mediterranean, due in large part to the decades of political instability of Libya. The historical treasure that is the city of Cyrene is worthy of preservation; it is our duty to recognize and honor that which has been passed to us from a people long gone, and in so doing honor their lives and contributions. Cyrene was founded as a colony of the Greeks of Thera (modern Santorini), traditionally led by Battus I, in 630 B.C.E., ten miles from its port, Apollonia (Marsa Sousa). Details concerning the founding of the city are contained in Book IV of the Histories of Herodotus. It promptly became the chief town of ancient Libya and established commercial relations with all the Greek cities, reaching the height of its prosperity under its own kings in the fifth century B.C.E. Soon after 460 B.C.E. it became a republic; after the death of Alexander the Great (323 B.C.E.) it was passed to the Ptolemaic dynasty. Ophelas, the general who occupied the city in Ptolemy I's name, ruled the city almost independently until his death, when Ptolemy's son-in-law Magas received governorship of the territory. In 276 B.C.E. Magas crowned himself king and declared de facto independence, marrying the daughter of the Seleucid king and forming with him an alliance in order to invade Egypt. The invasion was unsuccessful, and in 250 B.C.E., after Magas' death, the city was reabsorbed into Ptolemaic Egypt. Cyrenaica became part of the Ptolemaic empire controlled from Alexandria, and became Roman territory in 96 B.C.E. when Ptolemy Apion bequeathed Cirenaica to Rome. In 74 B.C.E. the territory was formally transformed into a Roman province. The inhabitants of Cyrene at the time of Sulla (c. 85 B.C.E.) were divided into four classes—citizens, farmers, resident aliens, and Jews—who formed a restless minority. The ruler of the town, Apion bequeathed it to the Romans, but it kept its self-government. In 74 B.C.E. Cyrene was created a Roman province; but, whereas under the Ptolemies the Jewish inhabitants had enjoyed equal rights, they now found themselves increasingly oppressed by the now autonomous and much larger Greek population. Tensions came to a head in the insurrection of the Jews of Cyrene under Vespasian (73) and especially Trajan (117). This revolt was quelled by Marcius Turbo, but not before huge numbers of people had been killed.. According to Eusebius the outbreak of violence left Libya depopulated to such an extent that a few years later new colonies had to be established there by emperor Hadrian just to maintain the viability of continued settlement. Plutarch in his work De mulierum virtutes ("On the Virtues of Women") describes how the tyrant of Cyrene, Nicocrates, was deposed by his wife Aretaphila of Cyrene around the year 50 B.C.E. Cyrene's chief local export through much of its early history, the medicinal herb silphium, was pictured on most Cyrenian coins, until it was harvested to extinction, and commercial competition from Carthage and Alexandria reduced the city's trade. Cyrene, with its port of Apollonia (Marsa Susa), remained an important urban center until the earthquake of 262. After the disaster, the emperor Claudius Gothicus restored Cyrene, naming it Claudiopolis, but the restorations were poor and precarious, and soon decadence hit Cyrene irremediably. Natural catastrophes and a profound economic decline dictated its death, and in 365 another particularly devastating earthquake destroyed its already meager hopes of recovery. Ammianus Marcellinus described it in the fourth century as "a deserted city," and Synesius, a native of Cyrene, described it in the following century as "a vast ruin at the mercy of the nomads." The final chapter occurred in 643, with the Arab conquest. Little was left of the opulent Roman cities of Northern Africa; the ruins of Cyrene are located near the modern village of Shahhat, in Libyan territory. Cyrene was the birthplace of Eratosthenes and there are a number of philosophers associated with the city including Aristippus, the founder of the School of Cyrene, and his successor daughter Arete, Callimachus, Carneades, and Synesius, bishop of Ptolemais in the fourth century C.E. Cyrene is also mentioned in the New Testament: One Simon of Cyrene was the person compelled by the Romans to carry the cross of Jesus as he was taken to his crucifixion, according to the Gospels of Mark (15:21-22), Matthew (27:32) and Luke (23:26). Several entries in the Book of Acts 2:10, 6:9; 11:20; 13:1, where Jews from Cyrene heard the disciples speaking in their own language in Jerusalem on the day called Pentecost. One of its more significant features; The fountain and sanctuary of Apollo, which was originally constructed as early as the seventh century B.C.E. The Venus of Cyrene and a colossal statue of Apollo were discovered here. The upper city, which contains the acropolis and a basilica modeled on the Kaisareion of Alexandria. Within this area is a large second-century house containing fine mosaics. The central area of the Roman town, or agora. The northern area of the city contains a huge Doric column marking the site of the temple of Zeus, a gigantic Doric building of the late sixth century B.C.E. There is also a Temple to Demeter and a large necropolis approximately six miles (ten km) between Cyrene and its ancient port of Apollonia. The necropolis is one of the most extensive and varied of the antique world. In 2005, Italian archaeologists from the University of Urbino discovered 76 intact Roman statues at Cyrene from the second century C.E. The statues remained undiscovered for so long because “during the earthquake of 375 C.E., a supporting wall of the temple fell on its side, burying all the statues. They remained hidden under stone, rubble and earth for 1,600 years. The other walls sheltered the statues, so we were able to recover all the pieces, even works that had been broken." The ruins of Cyrene have been famous since the eighteenth century. Archaeologists from the United States, Italy, France and Libya have variously worked at the site of the ruins. However, due to Libya's political instability in the final decades of the twentieth century and its subsequent isolation, that country has had little access to international expertise in classical Greek archaeological conservation. Years of learning and world-class conservation in Greece, Italy, Crete and the Mediterranean region have been unavailable to the Libyan archaeologists and the few conservators employed by the Department of Antiquities. The ruins of Cyrene have fallen victim not only to natural forces but looters as well, and are now on UNESCO's Endangered List. The Global Heritage Fund has formed a partnership between the University of Naples, the Libyan Department of Antiquities of Cirenica, and the Libyan Ministry of Culture which is working in the attempt to reverse decades of neglect and destruction. Libyans, Italians and Americans are working together on this project. In September 2007, Saif al-Islam Gadafi (son of Libyan leader Moammar Gadafi) announced the development of the Green Mountain Conservation and Development Authority, a conservation and development project. 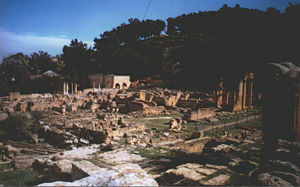 Centered on Libya's vast Green Mountain coastal region, the area includes the antiquities of Cyrene. Reaction to the announcement of the project was mixed, as some are skeptical of the motivation and determination of Gadafi. If the plans come to fruition the outcome could be quite positive for the care and restoration of the ancient ruins. ↑ University of Chicago, De Mulierum Virtutibus by Plutarch as published in Vol. III of the Loeb Classical Library edition, 1931. Retrieved June 10, 2008. ↑ UNESCO, December 21, 1981, International Council on monuments and sites - World Heritage List #190 Retrieved June 10, 2008. ↑ Mario Luni, As interviewed by The Art Newspaper (London 2005). ↑ 5.0 5.1 Global Heritage Fund, Cyrene, Libya Retrieved June 10, 2008. ↑ Heba Saleh, September 12, 2007, Libya hopes Green Mountain project will cleanse tainted past Gulf News. Retrieved June 23, 2008. Cassius Dio Cocceianus, Earnest Cary, and Herbert Baldwin Foster. 1914. Dio's Roman history, with an English translation. London: W. Heinemann. Global Heritage Fund. Cyrene, Libya - An ancient Greek site Retrieved June 10, 2008. Gottheil, Richard and Samuel Krauss. Cyrene Jewish Encyclopedia. Retrieved June 10, 2008. Lendering, Jona. Cyrene and the Cyrenaica Livius. Retrieved June 10, 2008. This page was last modified on 8 July 2016, at 19:48.